The immigration odyssey of one of China's most wanted men continues, after the Federal Court of Canada in Vancouver Monday granted a temporary stay to Lai Changxing blocking his deportation. 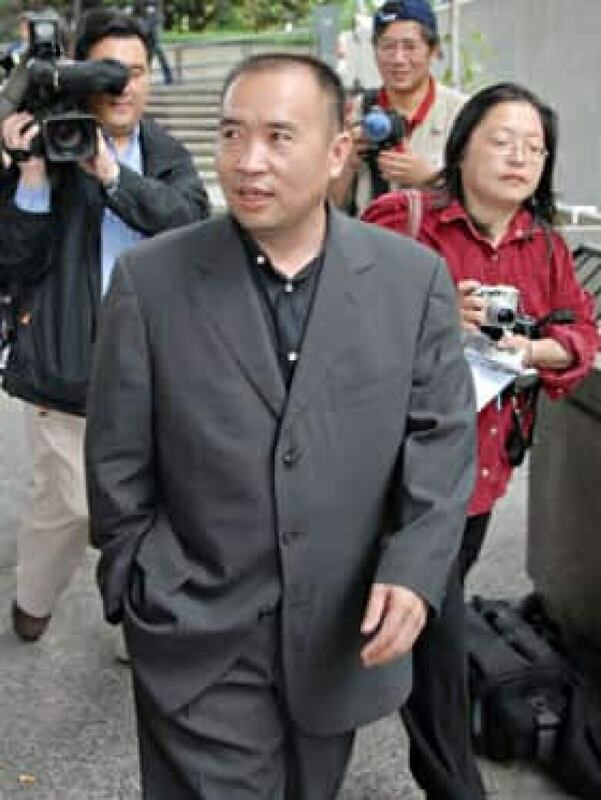 Lai Changxing, seen here in Vancouver in 2006, was taken back into custody last week. ((Don MacKinnon/Associated Press))The immigration odyssey of one of China's most wanted men continues, after the Federal Court of Canada in Vancouver Monday granted a temporary stay to Lai Changxing blocking his deportation. For 11 years, Lai has fought his return to China to face allegations he masterminded a vast smuggling ring that cheated the government out of billions of dollars in duties on imported goods and bribed officials to look the other way. He is also alleged to owe the Chinese government at least $300 million in back taxes. Lai was arrested in Vancouver late last week as the possibility of his removal drew near. A detention hearing is underway to determine if he poses a flight risk, but the federal court has granted the temporary stay until a hearing July 21. If Lai loses that appeal, he could be deported back to China as soon as July 22. Lai lost his initial refugee claim, but the Federal Court of Canada had been blocking his removal because it does not accept Chinese guarantees Lai would not be tortured or killed. A lawyer for the Canada Border Services Agency asked the Immigration and Refugee Board Monday to detain the Chinese fugitive until after the federal court decision, saying he poses a flight risk and has ties to organized crime. Lawyer Kevin Boothroyd told the board Lai should be held until then because he poses a flight risk. He said Lai could be expelled from the country as early as July 25. Boothroyd outlined a number of criminal connections Lai had with the Big Circle Boys gang and an association with well-known loan shark Betty Yan, who was found murdered in April 2009. He said the onus is on Lai to know the company he keeps. "The point of this is to keep him from people who can create documents to help him leave Canada under the radar," Boothroyd told the board member hearing the case. "I think it's been shown Lai continues to associate with organized crime, loosely associated as the Big Circle Boys. His curfew has been breached and he's fabricated evidence to cover a curfew breach." Lai's lawyer countered that his client has been under the same threat since 1999 but hasn't fled the country. "I would submit the evidence demonstrates that he is not a flight risk," Darryl Larson told immigration board member Leeann King. King has reserved her decision until Tuesday. Lai, wearing red board-issue cotton pants and a T-shirt, was handcuffed as he was escorted into the hearing room. He listened to the evidence through a Mandarin interpreter. Lai was initially under house arrest and had to put up a cash bond, then he was held under a curfew and eventually he even obtained a work permit as his case dragged on. Boothroyd said a pre-removal risk assessment was done and Lai was rejected. "Given the flight risk Mr. Lai poses, coupled with a negative criminal risk assessment, that puts Mr. Lai a lot closer to removal." Larson countered that he hadn't broken his conditions and the only reason he had been talking to Yan was because he borrowed money from the woman. "There was a dispute. Yan said he owed $300,000. Lai said he owed $150,000," Larson explained at the hearing. Yan was later found murdered in front of a illegal gambling operation in Richmond, B.C. Her murder hasn't yet been solved. Chinese authorities accuse Changxing of masterminding a network that smuggled as much as $10 billion of goods with the protection of corrupt government officials who he plied with cash, prostitutes and booze. Before fleeing to Canada in 1999, Lai lived a life of luxury in a seven-storey mansion and drove a bulletproof Mercedes-Benz. Canada and China do not have an extradition treaty. While China has given Canadian authorities assurances Lai will not face execution and last year said it would offer prison access to Lai by Canadian officials, Lai's lawyer maintains those assurances are not enough. His lawyer, David Matas, has said eight people connected to the case have already been executed in China and others have been jailed for sending Lai funds for his defence. Lai's ex-wife Tsang Mingna, whom he divorced in 2005, and one of their grown daughters returned to China in 2009 under a deal worked out with officials.